It’s the middle of February. We’re now two weeks removed from the Super Bowl, four weeks away from free agency, and 10 weeks away from the draft. For many, this is a known insufferable dead period for football fans. Or, for the true degenerates among us, it’s dynasty season. 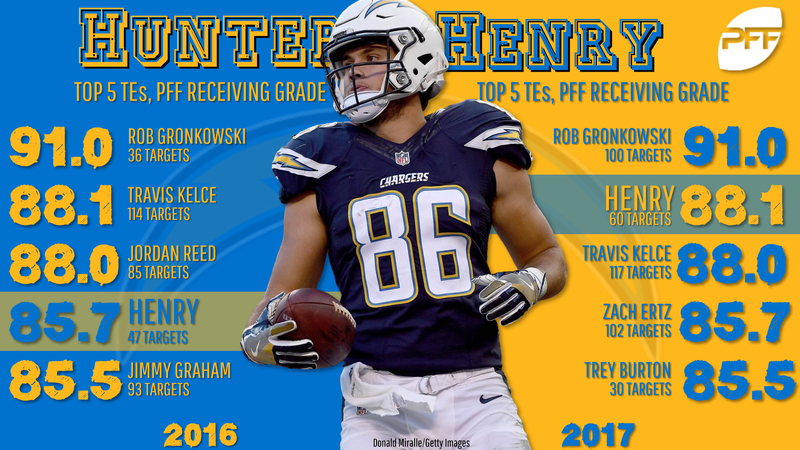 In 2016, Henry ranked as our fourth-highest-graded tight end as a receiver, behind only Rob Gronkowski, Travis Kelce, and Jordan Reed. In 2017, he ranked second, behind only Gronkowski. Over that span, he ranked second at the position in yards per target and third in yards per route run. Since entering the league, Henry has hit at least 70 receiving yards or scored a touchdown in 17 of his 25 targeted games (68 percent) – the highest rate in the league over that span. He did this while drawing just 44% of his team’s tight end targets, to Antonio Gates’ 54%. Heading into last season, the Chargers were ready to part ways with the 38-year-old Gates and give Henry a featured role. GM Tom Telesco said in May, “We really feel like this is Henry’s time. We need to get him even more involved than we did in the past.” Unfortunately, Henry tore his ACL in OTAs and didn’t return until the Divisional Round of the playoffs. Earlier this month I tried to highlight (here) just how much of an advantage it is to own a high-end tight end in fantasy leagues. Outside of the big-three I mentioned, the only other tight ends I’d consider likely to enter that realm are Henry and the far more expensive O.J. Howard (TE4 by ADP). Over the past two seasons, Jones is our highest-graded runner and leads all 87 qualifying running backs in yards per carry (5.50), ranking well ahead of teammate Jamaal Williams and his 3.72 yards per carry average. Prior to Jones’ Week 15 injury, we finally saw him being used as he should – as a bell cow. From Weeks 9 through 14, Jones played on 67% of the snaps, drawing 79% of the team’s carries and 77% of the team’s targets out of the backfield. Over this span, he averaged 13.9 carries, 4.1 targets, 99.6 yards, and 20.0 fantasy points per game. At his lowly ADP, he’s an easy value with elite upside (think Eddie Lacy in his prime). In 12 of the last 15 seasons, Andy Reid’s RB1 has finished top-eight among running backs in fantasy points per game. After signing a contract extension in December, and with Kareem Hunt no longer in the picture, it seems likely Williams is going to earn that role. There is, of course, a risk Reid might sign or draft a running back, or this might be a competition with Spencer Ware, but at Williams’ ADP I’m willing to gamble against that being the case. It certainly wasn’t in the Conference Championship round, when Williams played on 68% of the team’s snaps and drew 18 of the team’s 19 running back opportunities (ceding only one target to Ware). Over his last five games of the year, he averaged 5.25 yards per carry and 25.8 fantasy points per game. Dating back to college, in 2014, Dixon ranked fifth of 108 qualifying running backs in missed tackles forced per touch. In 2015, he ranked fourth of 114 qualifying. In 2016, his rookie year, he ranked first of 66 qualifying. He missed all of the 2017 season. Last year, he ranked first of 135. What does this all mean? Well, basically, Dixon is a very talented and highly elusive running back more than capable of creating yardage on his own. In addition to a PED suspension, Dixon has had trouble staying healthy, but Baltimore has stuck with him, and so have I.
Baltimore ranks third in targets to running backs since 2015 and, unlike Gus Edwards or Alex Collins, Dixon has shown competence in that area, averaging 2.5 receptions per game as a rookie in 2016. This is also a backfield that has lent itself well toward good rushing volume and hyper-efficiency (especially now with Lamar Jackson locked in as the starter). Once Jackson took over in Week 11, Baltimore’s running backs ranked second in carries and first in yards per carry (5.42). This might end up being a committee alongside the undrafted Edwards, but I’d bet heavily on Dixon ultimately commanding the bulk of the work. Miller was handpicked in the second round of last year’s draft by offensive wunderkind Matt Nagy, whose offense ranked 10th in points per drive despite Mitchell Trubisky ranking 33rd of 38 quarterbacks in PFF grade. Throughout Miller’s college career, he held a class-high 131.4 WR rating (passer rating when targeted). In his final season of college, he ranked sixth-best of 179 qualifying wide receivers in yards per route run from the slot (3.43). This was where he ran 69% of his routes in 2018, as a full-time player. Although his rookie numbers appear underwhelming, he also suffered a shoulder injury in Week 3 that would later become fully dislocated “numerous” times during the course of the season. He was a standout in camp, drawing rave reviews, and I’d bet on a big sophomore season once he’s back to full health. Yeah, he’s just one of my guys. 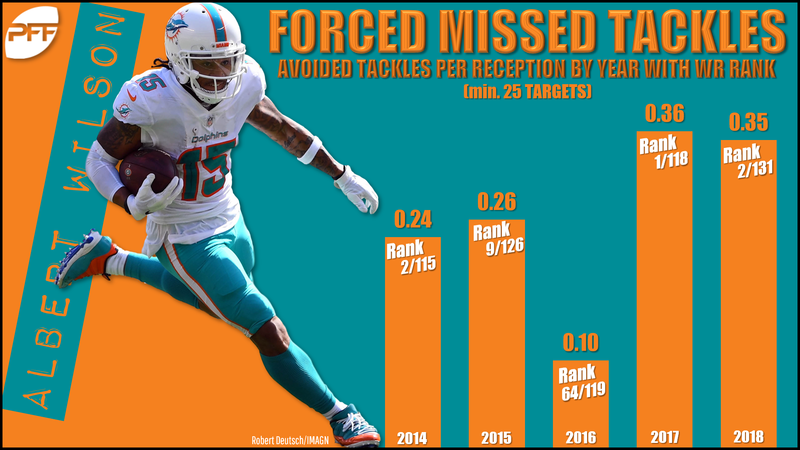 I wrote last season that I thought he was one of the best under-the-radar players at the position, based on a number of stats – mainly missed tackles forced per reception and yards after the catch per reception. Well, in 2018, he ranked first (of 105 qualifying wide receivers) in both categories. There are a number of reasons to be skeptical (new coaching staff, volume has never been great, etc.) but he’s also basically free. Much like Wilson, Tate is a lot better than most think, and for similar statistical reasons. Over the past six seasons, among all wide receivers with at least 50 targets, Tate has ranked fourth, third, second, 10th, fourth, and first in yards after the catch per reception. Over the past eight seasons, among all wide receivers with at least 50 targets, Tate has ranked second, third, third, second, fourth, first, first, and first in missed tackles forced per reception. In PPR points, Tate has finished 28th, 12th, 17th, 23rd, and 11th among wide receivers over the past five seasons. I’m willing to chalk 2018 up as an outlier and bet Tate’s next team gets more out of him than Philadelphia did. It’s probably likely, though certainly not a given, that Antonio Brown will be on a new team in 2019. This creates value for all of the remaining wide receivers. JuJu Smith-Schuster, though a great asset, likely won’t be too much of a value, already being drafted as a top-six dynasty wide receiver. James Washington is a better value (ADP: WR43), even after a lackluster freshman campaign. Washington was the No. 2 wide receiver in our draft guide last year, after winning the Biletnikoff Award in 2017. I also wouldn’t sleep on slot wide receiver Ryan Switzer (ADP: UDFA) who I loved in college and who actually outsnapped Washington 184 to 160 from Weeks 12 to 17. Fantasy tight ends typically underwhelm in their rookie seasons before taking a massive leap forward in their sophomore years, as shown in this article here. This is why I’ll usually avoid tight ends in rookie drafts and instead try to acquire the ones I like at a discount the following year. With that in mind, three tight ends stand out: Dallas Goedert (ADP: TE11), Mike Gesicki (ADP: TE12), and Chris Herndon (ADP: TE13). Goedert, by my estimation, is still the most desirable, despite likely being stuck behind Zach Ertz for the foreseeable future. Based mostly on his college production, I feel confident in saying he’ll be a fantasy stud at some point in his career, though it probably won’t be anytime soon. Gesicki, a combine superstar and abysmal blocker (that’s not necessarily a bad thing for fantasy), has the misfortune of losing the coach who drafted him, but could be in line for more volume in year two, given the lackluster receiving corps in Miami. Herndon was the surprise from this class (a fourth-round pick) but impressed in a full-time role (18th at the position in snaps) this year. Herndon was our highest-graded tight end this preseason and our No. 6 highest-graded tight end as a receiver during the regular season. There’s usually value in drafting or trading for older players at discounts, but especially so with quarterbacks who age more gracefully than the other positions. I’ll never forget, four years ago I traded a mid-second-round rookie pick for Ben Roethlisberger. My trade partner wanted to get rid of him because, “he was too old and would be retiring soon.” Obviously, he was wrong, and I wouldn’t be shocked if many of the following names have a longer starting career from this point forward than Josh Allen (ADP: QB14): Tom Brady (ADP: QB18), Drew Brees (ADP: QB20), Roethlisberger (ADP: QB:21), and Philip Rivers (ADP: QB24).